For me, going to Craig and Amy’s house for an overnight is like going home with none of the baggage. There is always something wonderful in the oven. There is always someone wonderful to talk to. There is always a snarky comment or two to keep you honest and laughing. There are always kids of all ages melding into one fabulous, happy crowd. There are always meals to help cook and dishes to help do. And, for those daring enough to play, there is always competitive Scrabble after dinner. In short, it is my idea of heaven! Last night, as I sat in their kitchen catching up with them as they prepared dinner, Amy pulled out a cookbook I had made for her years ago of my favorite and most trusted recipes. She turned to a page and announced that she was making my Gingerbread Cake for dessert. I looked at her blankly. “You know the one,” she said. “I do?” I said, still perplexed. “Sure, you know… the one with the lemon glaze.” A vague recollection began to form. I looked at the recipe for help and for a moment I wasn’t even sure that I still had it in my files. Meanwhile, Amy measured and mixed and in ten minutes flat the cake was in the oven. “Hmmm,” I thought, “that was fabulously fast.” The kitchen soon filled with the wonderful smells of molasses, ginger and cinnamon and 35 minutes later a perfect cake appeared from the oven. After dinner, as we tucked into the moist and rich cake, it became clear why this little cake had made it into the “Caroline Cookbook.” Now the only question was, how did I lose it for so long? 3 T. freshly squeezed lemon juice. Sift the flour, baking powder, ginger, cinnamon and salt into a mixing bowl. Add the egg, sugar and molasses and mix well. Add the boiling water and oil. Mix well. Pour into a greased 9” square baking pan and bake for 35-40 minutes. Meanwhile, combine the confectioner sugar and lemon juice and mix well. Spread the glaze over the cake immediately after removing it from the oven. This entry was written by Caroline, posted on January 31, 2010 at 10:35 pm, filed under baking, desserts, good times, kid friendly. Bookmark the permalink. Follow any comments here with the RSS feed for this post. Post a comment or leave a trackback: Trackback URL. This sounds delicious. I love the idea of lemon glaze instead of the plain old sugar variety. Inspired! 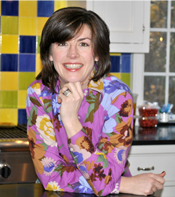 As a fellow foodie I like your blog, love your humor, and your recipes are great. I can’t wait to try those oatmeal cookies…they will surely earn a spot in my cookbook next to the wonderful gingerbread recipe! your humor and fine ear will guide me onight as i take on the gingerbread for my daughter’s bake sale. if the food tastes as good as you read then this will be the beginning of a wonderful relationship!